* A nicer place to visit than one might expect from its mass tourism, especially if you stick to the area around the harbour and the old town of Le Suquet - ''s/y Athene of Lymington''. 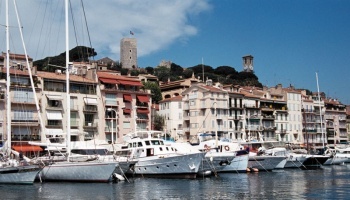 Cannes is arguably the best-known city on the Riviera coast of France. Originally little more than a ferry harbour for the offshore Iles de Lerin, a Saracen attack in 891 forced the monastic residents of the islands to seek a better protected location on the hill of Le Suquet overlooking what is now the harbour of Cannes. A settlement flourished around the castle of Le Suquet and became independent of the monks in 1530. The area was later a battleground between French, Spanish and British naval forces, covetous of the sheltered anchorage and fresh water springs of the Iles de Lerin. The British returned in force during the course of the 19th century, but this time it was in the form of the English aristocracy of the so-called 'Belle Epoque', who were tempted by the summer-long sunshine and healthy climate to build palatial villas along the coast. With the arrival of the railways at the end of the century, Cannes became even more accessible, and construction followed of a series of luxury hotels along what is now the Boulevard La Croisette facing the beach of the same name. Thirty years later, when wealthy Americans started arriving in the aftermath of the Great War, Cannes' fate was sealed: it was henceforth the tourist capital and magnate magnet of the Riviera. Its international reputation was further enhanced with the launch of the first Cannes Film Festival in 1946, since when it has become an important showcase for European films and - at least until recent years - a photocall opportunity for some of the most celebrated (and often scantily-clad) movie stars in the world. 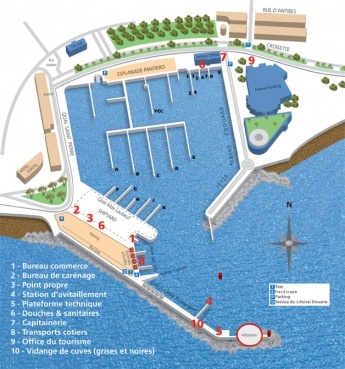 The port of Cannes is organised as one vast marina, catering for all sizes of vessel. Its good rail links (and airport at Nice) make it a handy option for yachts planning to provision or change crews prior to a run down to Calvi or Ajaccio on Corsica. The weather is mostly benign, only dropping below 10 degrees C during the months of December to February and averaging 25 degrees from June to September. Seebreezes predominate during these months and even during a mistral the effects are not felt until some 10-15 miles offshore. The Iles de Lerin are a good landmark when approaching from any direction. Closer in, the tall white port marker at the end of the western breakwater will be seen. Cannes is a port of entry/exit to France. Submit details about facilities for checking in - location of immigration & customs, etc. Cannes harbour is very busy during the season. While the Cannes Boat Show is on (early September) berths are as rare as snowballs in Hell, and it's best to avoid Cannes until it's over. You are advised to call Port de Cannes on channel 12 before entering. The telephone number of the capitainerie is +33 (0)4-898-898-28. Port de Cannes has a total of 800 berths, 250 of which are supposedly reserved for short-stay mooring. This, however, does not translate into easy berth availability during July and August. Yachts berth wherever directed by the capitainerie, which is based in the building at the NE corner of the harbour. The toilet and shower facilities are also in this block. There is a lift-out area at the SW corner of the harbour which is equipped with a 65T travel hoist. Depending on conditions, a yacht may either anchor west of the harbour breakwater in Golfe de la Napoule or east of the harbour well clear of the freeway, where there is some shelter from the breakwater in light southerlies. In strong southerlies, it is best to anchor at the Iles de Lerins, where Ile Sainte-Marguerite offers a lee. Ile Sainte-Marguerite and Ile Saint-Honorat, collectively known as the Iles de Lerins (details needed). Fuel station on the Quai du Large just inside the breakwater. Water and electricity at all berths. Among the 'must do' shoreside activities in Cannes is a walk along the Boulevard La Croisette, where you can inspect the handprints of the famous outside the Festival building (Sharon Stone – dainty; Sylvester Stallone – hams of meat) and soak up the hectic atmosphere of the golden beach of La Croisette. The steep walk up to the old citadel of Le Suquet is rewarded with superb views over the harbour and the coast beyond. The museum in the citadel has an interesting collection of ethnographic artefacts, old paintings of Cannes and even better views from its 12th century tower. Good restaurants in the Rue le Suquet (the steep road leading up to the citadel). Partial WiFi coverage on east side of harbour. Launderette in the harbour office (token operated). Several outlets in the town. Bins on every quay (daily collection). A nicer place to visit than one might expect from its mass tourism, especially if you stick to the area around the harbour and the old town of Le Suquet - s/y Athene of Lymington.